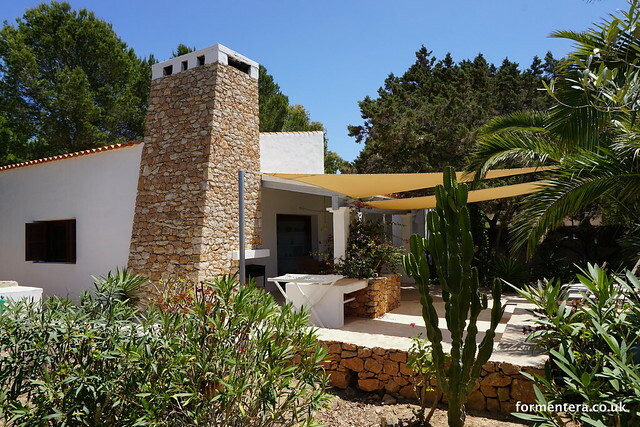 This property is located in a beautiful and peaceful area of Formentera, close to the beach and with access to a communal swimming pool at the Paraiso de los Pinos bar and restaurant complex just 50 metres walk from the property. Bedroom 1) Double bed with ensuite and air conditioning. Bedroom 2) Twin beds with air conditioning. Bedroom 3) Double bed with air conditioning. Large open plan kitchen/ diner / living room leading to South facing rear terrace. Outdoor dining table and sun loungers. The property has undergone a full reformation in 2014 and is in immaculate condition. Cleaning is available for 15 € / hour.